After watching Disney’s Frozen, I couldn’t wait to visit Bergen, Norway, the city that Arendelle is based on. Beautiful Bergen with its busy harbor was everything I had dreamed it would be. Bergen is a popular stop for Scandinavian cruise ships, but it is also a great place to relax for a few days. If you have only one day, you can enjoy the history of this quaint Norwegian town and will love shopping in Bryggen (the German quarter and most-photographed part of Bergen). If you have a little more time, explore the city thoroughly and visit Edvard Grieg’s Troldhaugen. However long you stay, plan for rain in Bergen. On average it rains 231 days a year in Bergen, so you will likely be wet at some point during your visit. Here are my favorite things to do in Bergen, Norway. Bryggen is the name for the old wharf section of Bergen that is identified by the colorful wooden houses. It is preserved and remembered for the Hanseatic traders who lived there from the 14th to 16th century. These wooden homes have burnt down and been rebuilt over and over. Want to understand the history of Bryggen before you visit? Check out it’s listing on the UNESCO Heritage List. You will get centuries of Bergen history if you visit the buildings and museum in Bryggen, including the Rosencrantz Tower, Haakon Hall, St. Mary’s Church, the Bryggens Museum, and the Hanseatic Museum. Each of these places are located near one another and were easy to see in one day. Our favorite of the museums was the Hanseatic Museum, but you really should catch the guided tour when you visit the Hanseatic museum. A guided tour is included in the entrance fee, and when we visited it was offered at 11:00 and 3:00 that day. We popped in at 2:00, found out about the guided tour option, and did a little souvenir shopping in the nearby shops while we waited until 3:00 for the guided tour. This museum is fascinating but has very little signage to tell you what you are looking at, so I was glad we saw it with a guide. Most interesting thing I saw in Bryggen? Probably the 100-year-old fish preserved in salt and still edible today. The big tourist thing to do in Bergen is ride the Funicular up the to of Mount Floyen for the beautiful views. You can easily walk to the entrance of the Funicular from the harbor. It’s perhaps a 10-minute walk from Bryggen. The Funicular is a ride up the mountain in a glass trolley car that goes right up the mountain. The ride was great, but the views up top were spectacular, even on an overcast and rainy day. At the top of Mount Floyen, stop for a great photo op with a troll and let the kids play on the playground. Explore one of the many well-marked hiking trails up top and spend a little time outdoors. We walked around a beautiful lake and forest only a few minutes away from the Funicular. We opted to walk down the mountain into the city rather than ride the Funicular down, and we wandered down beautiful paths and cobblestone streets as we returned to the city. It took us about 50-60 minutes to walk down, but it was worth it! There is a gift shop and restaurant up top, but we didn’t eat there. The best thing about the Funicular is that it opens early and closes late so you can do it at your convenience. I suspect that sunset from Mt. Floyen would be beautiful. One of the many colorful streets you will see in the residential area of Bergen. The Bergen Fish Market is less a traditional fish market with the morning’s fresh catch coming in and more of a tourist fish market. Plenty of shops with unique Norweigan foods to explore, such as reindeer sausage and Norweigan cheeses. We loved walking through, sampling a few things, and we finally settled on fish soup and fish and chips from a small blue stand that was making fresh cod fish and chips as we waited. Really fresh and yummy, especially on a cold, rainy day. My favorite piano piece to play when I was taking lessons was “Wedding Day at Troldhaugen” by Edvard Grieg, so when I found that I could actually visit Troldhaugen in Bergen, I made it a priority. This small museum and home tour will be interesting to anyone who appreciates music and historical home tours in a scenic setting. The Grieg museum gives a great overview of his life (did you know he was only 5’2″ tall? ), his music, and even some modern Norweigan history. I loved walking down to the water to the small cottage where he composed his music and seeing where he is buried. Grieg’s home takes a little effort to get to since it is located outside of the tourist part of downtown Bergen, but the experience of traveling there will give you a flavor of what life in Bergen is like for residents, and I appreciated that. We were in a rental car and drove to Troldhaugen. Several city buses or sight-seeing buses can take you to Troldhaugen. Plan 1-2 hours to enjoy Troldhaugen, plus additional time for transportation. Should you get a Bergen Card? If you choose to get a Bergen Card (we did), you will be able to wander quickly in and out of several museums that have interesting history about Bergen and Norway. The Bergen card will only be worthwhile if you plan to visit several museums, but I was glad we had it. You can get a free return trip on the Funicular with the Bergen card, and entrance to many other Bergen attractions if you’ve got time for them. We visited five museums. In the end, we probably got the equivalent of free admission to one. Not a huge savings, but worth it. Ditch the car and plan to do most of Bergen on foot. Parking downtown will be nearly impossible, so if you plan to do it, research it in advance. Bring a raincoat and waterproof shoes. I wore my waterproof Keen hiking shoes all day and was so glad I had them. My feet stayed dry despite the rain. Bring Rick Steves Snapshot Norway with you. I loved the history he gave of Bryggen and his walking tours never disappoint. Order fish soup. Seriously, if you don’t know about the fish soup in Norway, you will miss out on one of the finer dining experiences in Norway. Each restaurant has a unique fish soup, and they are usually a house speciality. They are generally a creamy soup with different herbs and spices. I loved each one I tried and they were all quite different. Bergen was everything I had hoped it would be. The historian in me loved learning about the interesting trade history of Bryggen and the importance of Bergen in Norway’s history. But mostly I enjoyed the simple beauty of the bustling harbor nestled among lush, green mountains. We picked up our favorite Norweigian souvenirs in the shops here, and ate delicious food in Bergen. It was a beautiful place to end our Norwegian vacation. If this post was helpful to you, will you please Pin it or share it on other social media sites? Thank you! Photo Essay: Beautiful Photos of Norway my husband took of our trip in May 2015. Disclosure: This post contains Amazon affliiate links. I hope you can visit sometime, Sarah. I have to cross the pond to do it, but really hope to return! Looks like a lovely visit! I wouldn’t have known that fish soup is a delicacy, I’m sure it was delicious! I had a friend clue me in to the fish soup before I went or I would have missed it. So glad I didn’t. It was truly the best thing I ate in Norway. I have been dreaming of Norway for as long as I can remember, and it has nothing to do with Frozen 🙂 I have a thing for colorful harbour towns. I hope you can make it to Norway someday. I can’t believe how quickly I fell in love with this beautiful country. Seems almost like a dream now that I’m home. You would love the villages along the fjords as well–so cute and quaint and homes painted ever color. I haven’t tried herring soup. I’ll have to look for it sometime! But did you try that 100-year old fish? I’ve always to go to Bergen, but never made it out of Oslo. Makes me realize now would be the perfect time to go with my 10-year-old. 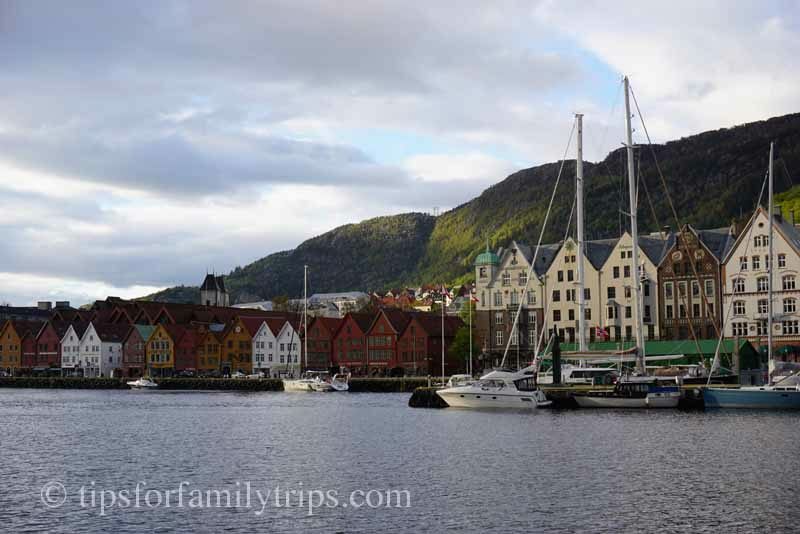 I think kids would love Bergen … Hope you can go sometime! I love how the grey sky contrasts the colourful buildings. We’ve never heard of Bergen before, but it looks remarkable! This definitely inspired us to read more about it…we just might have to visit one day! I wasn’t familiar with Bergen before I started planning my trip to Norway, but I highly recommend Norway. Fell in love with this beautiful, adventurous country! Hope you can visit someday. I also was not so familiar with Bergen in Norway. The pictures look lovely and the food very interesting. We will have to look into it in the near future.